A Greek-Orthodox church and monastery, located in the Christian quarter. It was built in the 11th C over the ruins of an earlier 5th C Byzantine church, which is located on a lower level. John 3:28: "I am not the Christ, but that I am sent before him". A Greek-Orthodox church and monastery located in the Christian quarter. 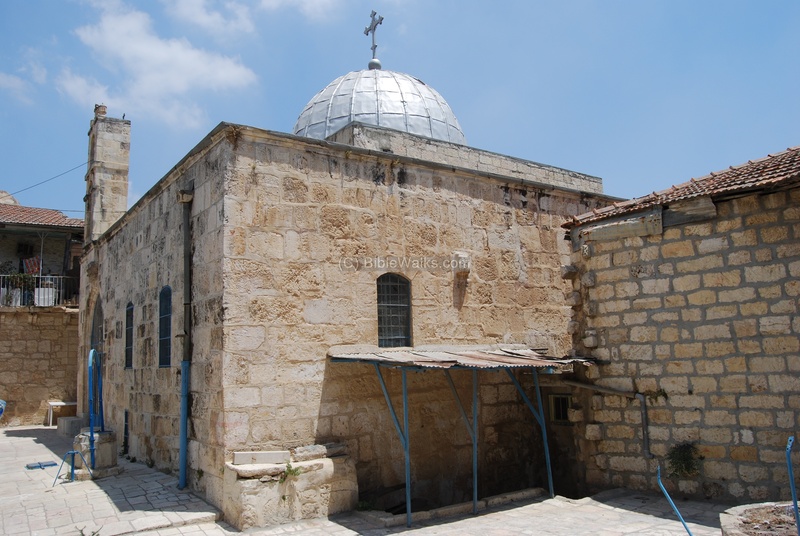 An early 5th C Byzantine church is located on a lower level, while the dome and bell tower that are seen today date to the Crusaders (11th C). 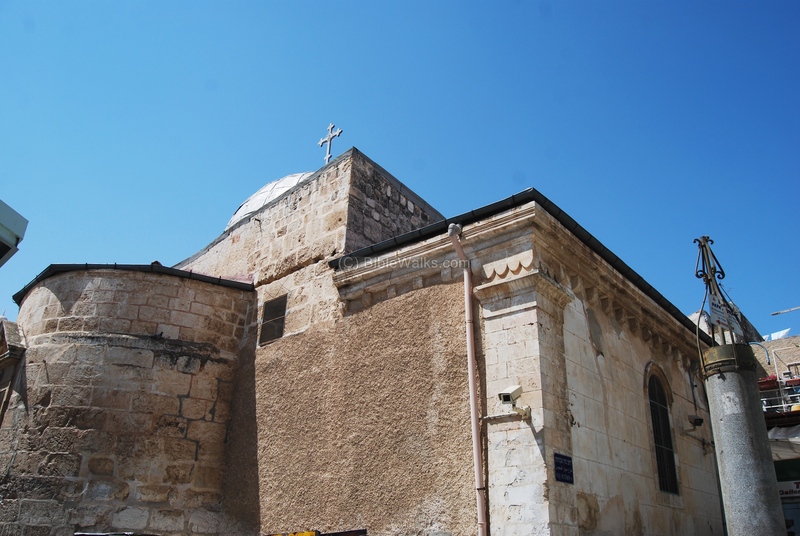 The ancient church was built in the 5th C AD, and is one of the oldest in the Holy Land. 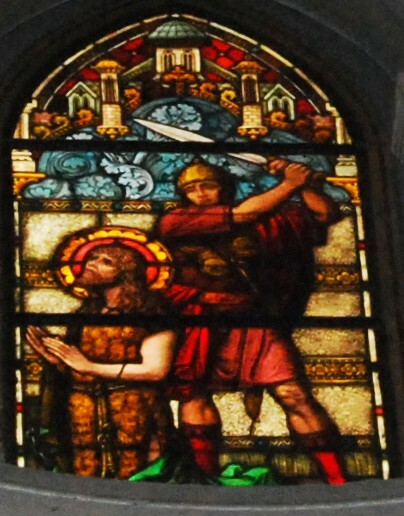 It was dedicated to John the Baptist, and it is possible that the church presented some of St. John's relics, including fragments of his skull. According to Orthodox tradition, his head was buried in this church. The church was destroyed during the Persian or Arab conquest (7th C). Later, the Arabs permitted a group of Italian merchants to build a new church over the ruins of the Byzantine church. The site became the center of the Knights Hospitallers , and functioned as a hostel and a hospital to the wounded Crusaders during the conquest of Jerusalem in 1099. The hospital was located on the north side of St. John, in an area called Muristan (based on the Persian name for hospital). At the 11th C the Crusaders purchased and renovated the church and monastery. The Knights named their order after John, and were called the "Knights Hospitallers of St. John", or commonly known as the Hospitallers. They became one of the important military orders defending the Holy Land, and established other structures and installations such as the knights halls in Acre (1104). The hospital was relocated to Acre after the fall of Jerusalem (1187), and then to Cyprus after Acre's fall (1291) and Rhodes (1309). The monks continued to reside in the complex even after the defeat of the Crusaders. In 1839 the church and monastery were renovated. The order of St. John is a worldwide organization with some 30,000 members. The church and monastery is operated by the Greek Orthodox church, and open to the public. The Greek Orthodox is the largest faith community in the Holy Land with about 100,000 members, and is the biggest landowner. 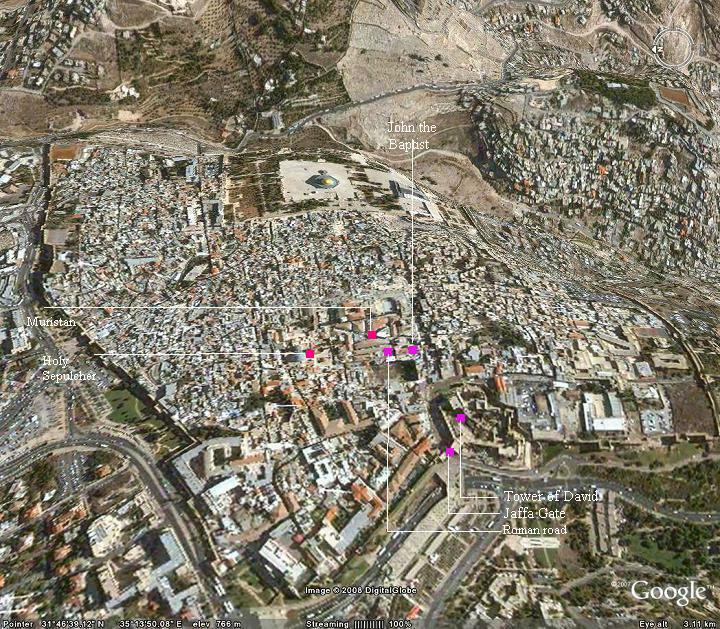 The site is located inside the old city walls, close to the Jaffa gate and David's tower. You can park in the public parking near Jaffa Gate, walk through David street and turn left into Christian Quarter road - to number 113. An aerial view is seen below showing the points of interest. You can point on the purple points to navigate to the selected point. 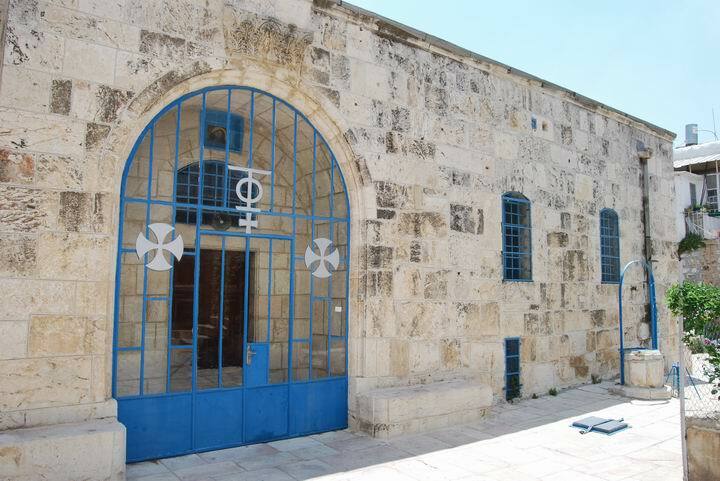 The entrance to St. John the Baptist is on the Christian Quarter road, which starts at David street near Jaffa gate and David tower, and crosses the Christian quarter towards the north. 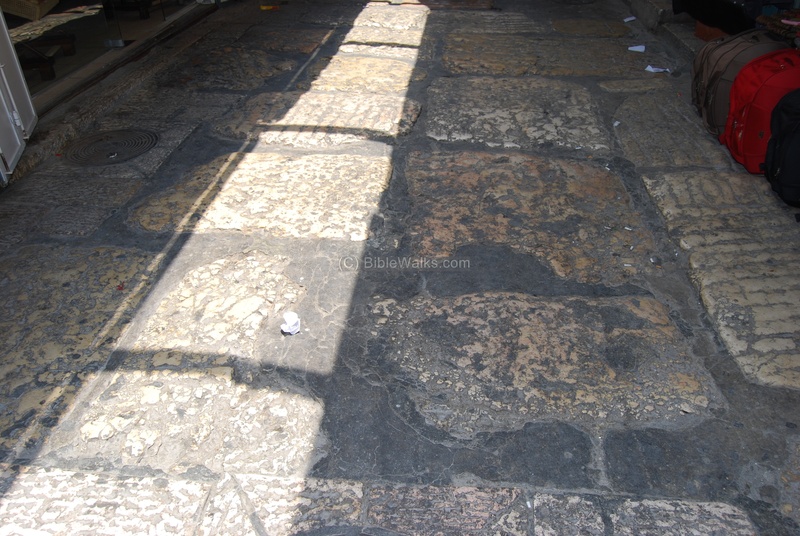 After a short distance it crosses St. Helena street, which leads to the southern entrance to the Holy Sepulcher. 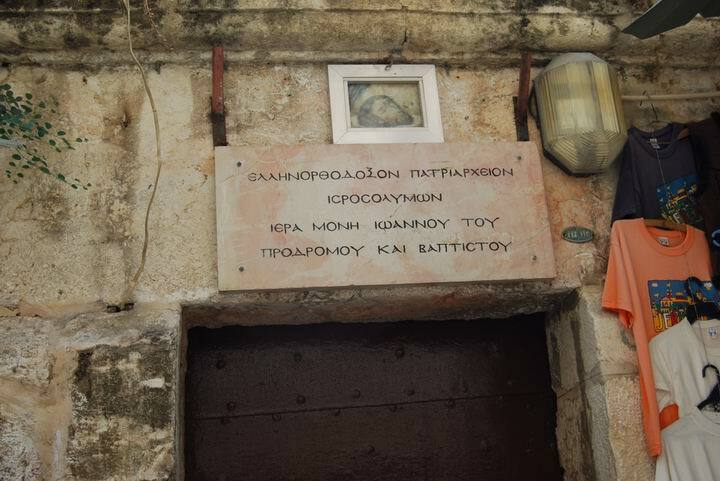 The sign below includes the word "Prodromos" on the lower left line, which means "the forerunner" - since John Baptized Jesus, and proclaimed Him as the Messiah. John himself said "I am not the Christ, but that I am sent before him". The painting illustrates his head, which was beheaded by Herod Antipas; according to Orthodox tradition is buried here. This is the view of the church St. John the Baptist - a double bell tower above the facade and a dome behind it. The structure is the modern church, while the 5th C Byzantine church is located underground. A staircase leads to the lower level. Another view of the church - the double bell tower and the dome behind it. This is the Crusaders period structure. 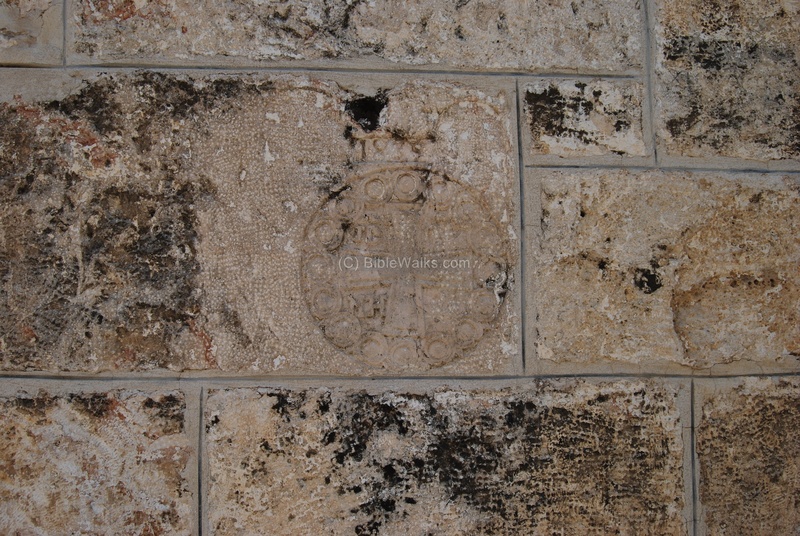 The stone below shows the date of 1839 (seen above the cross) when several restorations were conducted by the Greek Orthodox church. In the courtyard is an ancient well, based on a reservoir that fills during the rainy season. Another side of the courtyard is seen below. 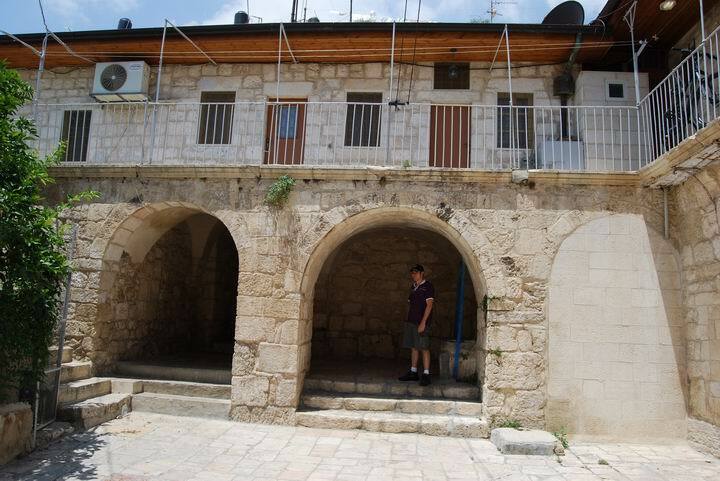 The rooms around the courtyard are the dwellings of the Greek-Orthodox monks that reside in the monastery. A section of a paved Roman road is located on the Christian Quarter street not far from St. John. It was discovered during the restorations conducted at this area in 1977, under the modern level. This paved section dates to the end of the Roman period - 3rd/4th C AD. 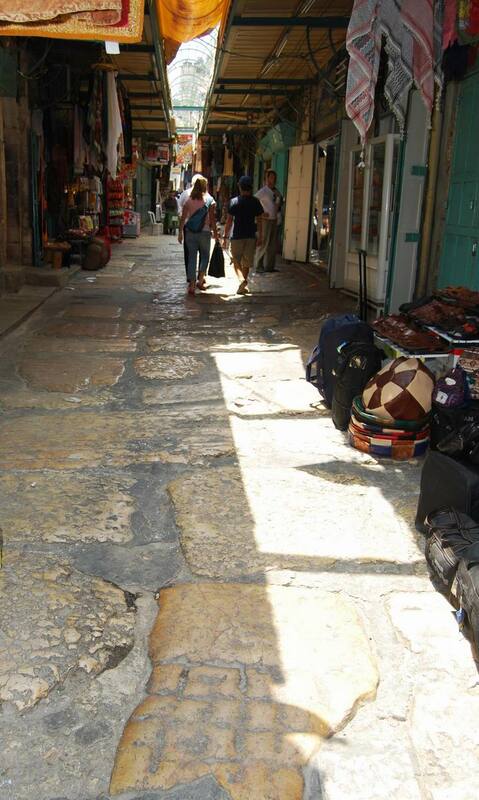 In the photo below is a section of the paved Roman road, flanked by modern shops. Another section of the Roman road, which once connected David's tower to the north. In the old city are other sections of the Roman and Byzantine periods, such as the Cardo Maximus. 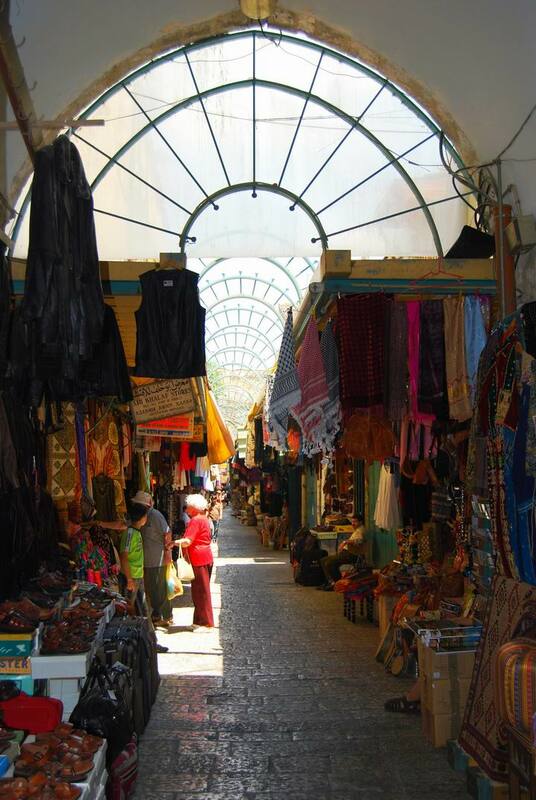 In the narrow streets near St. John, on both sides of the street, are covered markets. These small shops sell a variety of goods: sandals and clothes, food, decorated ceramics, candles and souvenirs. 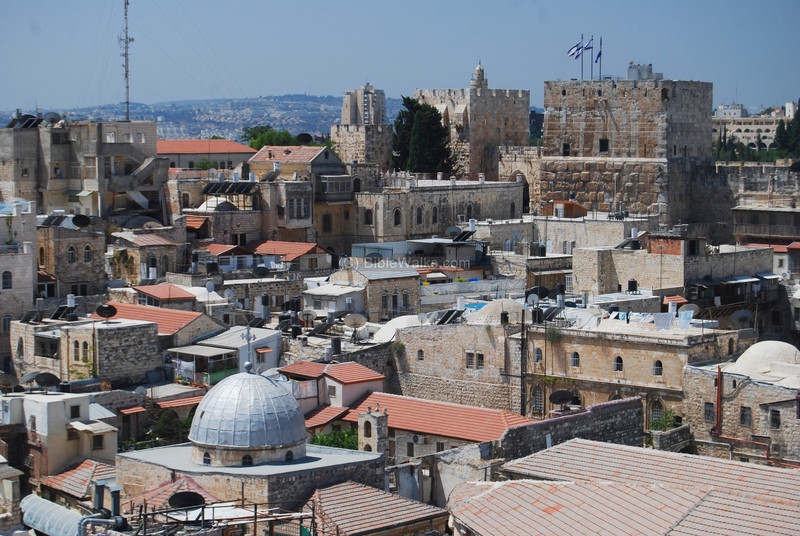 The photo below shows a view from the bell tower of the Church of Redeemer, with the silver dome of St. John the Baptist in the foreground and the Tower of David in the background. A lower view of the rear side of the church, from the nearby Avtimus market in the Muristan area, is seen below. These New Testament texts refer to John the Baptist. "In those days came John the Baptist, preaching in the wilderness of Judaea, And saying, Repent ye: for the kingdom of heaven is at hand. For this is he that was spoken of by the prophet Esaias, saying, The voice of one crying in the wilderness, Prepare ye the way of the Lord, make his paths straight. And the same John had his raiment of camel's hair, and a leathern girdle about his loins; and his meat was locusts and wild honey. Then went out to him Jerusalem, and all Judaea, and all the region round about Jordan, And were baptized of him in Jordan, confessing their sins. But when he saw many of the Pharisees and Sadducees come to his baptism, he said unto them, O generation of vipers, who hath warned you to flee from the wrath to come? Bring forth therefore fruits meet for repentance: And think not to say within yourselves, We have Abraham to our father: for I say unto you, that God is able of these stones to raise up children unto Abraham. And now also the axe is laid unto the root of the trees: therefore every tree which bringeth not forth good fruit is hewn down, and cast into the fire. I indeed baptize you with water unto repentance: but he that cometh after me is mightier than I, whose shoes I am not worthy to bear: he shall baptize you with the Holy Ghost, and with fire: Whose fan is in his hand, and he will throughly purge his floor, and gather his wheat into the garner; but he will burn up the chaff with unquenchable fire". "Then cometh Jesus from Galilee to Jordan unto John, to be baptized of him. But John forbad him, saying, I have need to be baptized of thee, and comest thou to me? And Jesus answering said unto him, Suffer it to be so now: for thus it becometh us to fulfil all righteousness. Then he suffered him. And Jesus, when he was baptized, went up straightway out of the water: and, lo, the heavens were opened unto him, and he saw the Spirit of God descending like a dove, and lighting upon him: And lo a voice from heaven, saying, This is my beloved Son, in whom I am well pleased". 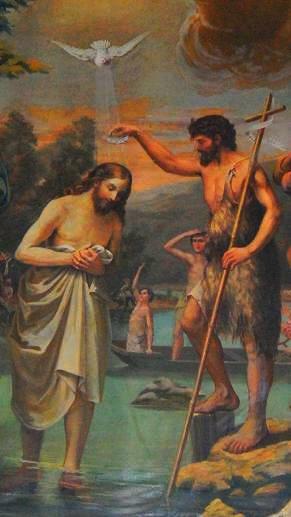 "Ye yourselves bear me witness, that I said, I am not the Christ, but that I am sent before him". "For Herod himself had sent forth and laid hold upon John, and bound him in prison for Herodias' sake, his brother Philip's wife: for he had married her. For John had said unto Herod, It is not lawful for thee to have thy brother's wife. Therefore Herodias had a quarrel against him, and would have killed him; but she could not:".
" For Herod feared John, knowing that he was a just man and an holy, and observed him; and when he heard him, he did many things, and heard him gladly. And when a convenient day was come, that Herod on his birthday made a supper to his lords, high captains, and chief estates of Galilee; And when the daughter of the said Herodias came in, and danced, and pleased Herod and them that sat with him, the king said unto the damsel, Ask of me whatsoever thou wilt, and I will give it thee. And he sware unto her, Whatsoever thou shalt ask of me, I will give it thee, unto the half of my kingdom. And she went forth, and said unto her mother, What shall I ask? 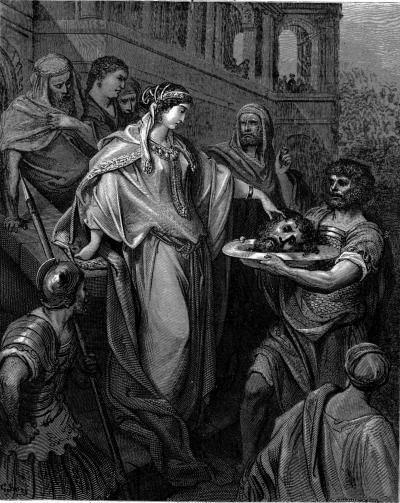 And she said, The head of John the Baptist. And she came in straightway with haste unto the king, and asked, saying, I will that thou give me by and by in a charger the head of John the Baptist. And the king was exceeding sorry; yet for his oath's sake, and for their sakes which sat with him, he would not reject her. And immediately the king sent an executioner, and commanded his head to be brought: and he went and beheaded him in the prison, And brought his head in a charger, and gave it to the damsel: and the damsel gave it to her mother. And when his disciples heard of it, they came and took up his corpse, and laid it in a tomb". "Now some of the Jews thought that the destruction of Herod's army came from God, and that very justly, as a punishment of what he did against John, that was called the Baptist: for Herod slew him, who was a good man, and commanded the Jews to exercise virtue, both as to righteousness towards one another, and piety towards God, and so to come to baptism; for that the washing [with water] would be acceptable to him, if they made use of it, not in order to the putting away [or the remission] of some sins [only], but for the purification of the body; supposing still that the soul was thoroughly purified beforehand by righteousness. Now when [many] others came in crowds about him, for they were very greatly moved [or pleased] by hearing his words, Herod, who feared lest the great influence John had over the people might put it into his power and inclination to raise a rebellion, (for they seemed ready to do any thing he should advise,) thought it best, by putting him to death, to prevent any mischief he might cause, and not bring himself into difficulties, by sparing a man who might make him repent of it when it would be too late. Accordingly he was sent a prisoner, out of Herod's suspicious temper, to Macherus, the castle I before mentioned, and was there put to death. Now the Jews had an opinion that the destruction of this army was sent as a punishment upon Herod, and a mark of God's displeasure to him".